A political legend, a community builder, a husband and father died Wednesday in Ottawa. Paul Dewar was just 56 and passed away a year after being diagnosed with brain cancer. Dewar's health declined rapidly over the last 12 months. Still he prepared meticulously, starting a youth movement and writing his own farewell, saying he found his way to peace, and urging us to create a peaceful, better world. Dewar always said his illness was a gift. It gave him a chance, he said, to see the wonder of the world around us. Many would consider Paul Dewar a gift to this city and this country. He was a gentle man with a ferocious commitment to fairness. His dying wish was for all of us to build upon the work where he left off. With a heavy heart, Ottawa resident Catherine Boucher plants the sign she made last February of Paul Dewar, right after Dewar's diagnosis. With a large photo of his face, framed with a heart, it is now a symbol of Paul's passing. “I think he reflected the kind of positive community spirit we want,” Boucher said. It's a sentiment playing out on many streets in Ottawa today as residents remember one of the good guys. Paul's spirit passed from this earth Wednesday afternoon, almost a year to the day that he had been diagnosed with terminal brain cancer. “That’s the journey I’m on,” he told CTV’s Graham Richardson in an interview last summer. "Smile and play; laugh and dance; give and share." “I guess just take his message to heart,” said an emotional Catherine McKenna, Federal Minister of the Environment and Climate Change, who had beaten Dewar in Ottawa Centre during the last federal election, “We can all do our part, big and small to build a better community and we should continue to do that." Dewar was a member of the NDP, who represented Ottawa Centre for nearly a decade. Today, politicians on all sides honored him with a moment of silence, reflecting on his passion for public service; a passion he inherited from his mother, former Ottawa Mayor Marion Dewar. Last November, Dewar was given the key to the city to honor him. That's the last time his friend Ottawa councillor Catherine McKenney saw him. Dewar had hoped to follow in his mother's footsteps and run for mayor. While his cancer diagnosis derailed that pursuit, it fueled another of his passions: empowering tomorrow’s leaders through an organization called Youth Action Now. Today was a bittersweet moment for the young people continuing his legacy. In that Facebook post, Paul Dewar wrote: "the time has come for me to say goodbye." 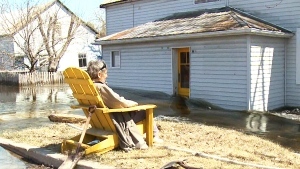 Catherine Boucher says she's not ready for that yet and plans to leave her lawn sign up until the snow melts.